A common claim of the Ontario Government is that it can be more aggressive in financing system expansion because of the accounting rules under which it operates. The essential difference is that a capital transfer to a municipality, for example the provincial share of the subway extension to Vaughan, must be booked as an expense and the money disappears off of provincial books. 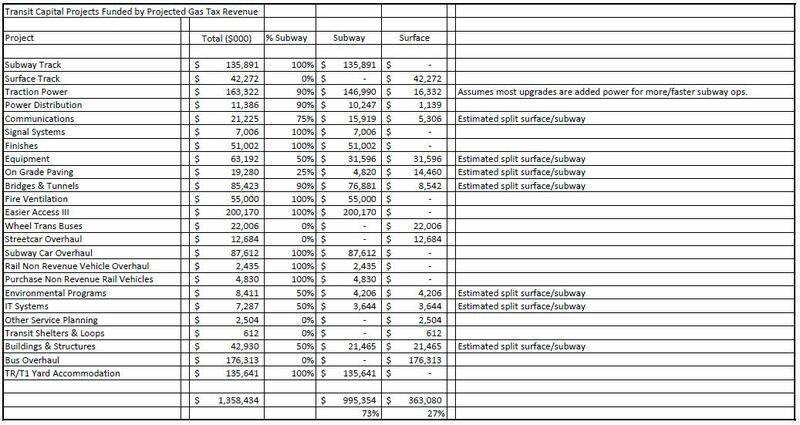 If the subway is owned by Ontario, then it is treated as a capital asset offsetting the debt. 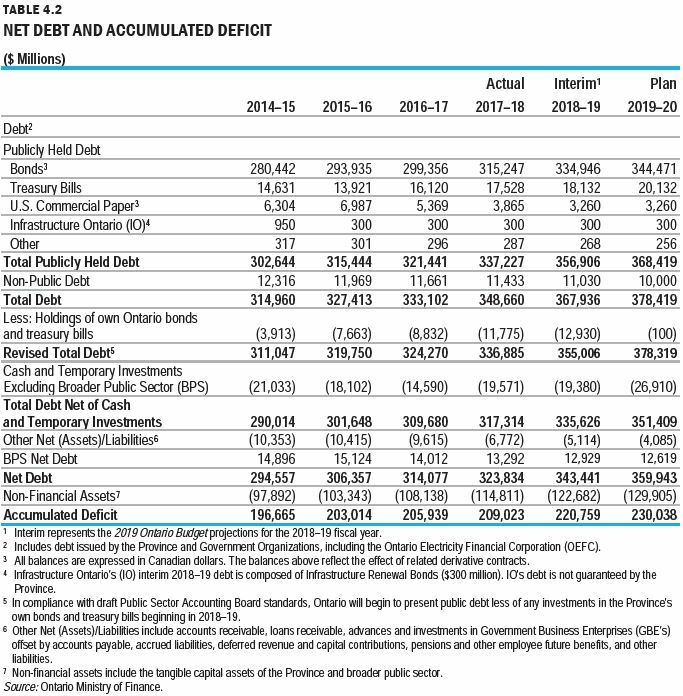 Moreover, there is a good chance that Ontario will never actually pay off the debt and it will simply pile up in the accumulated provincial borrowing to be rolled over when it matures. By contrast, municipalities borrow over the expected lifetime of a project and pay off their debts in order to leave room for future capital spending and associated borrowing. Ontario can build more, faster, because it has a less constrained, and one might well argue, less responsible attitude to debt costs and their burden on future budgets. This is not a peculiarly Liberal or Conservative problem, but a fundamental part of how the provincial and federal governments operate. Ownership is all about accounting and the ability to spend on the never-never for provincial projects in a way that would look far worse on provincial books if the money went to direct municipal transfers. This shows up in a table of the provincial net debt. Although the province expects to have a total debt of $378 billion, this is offset by almost $130 billion in “Non-Financial Assets” which include “the tangible capital assets of the Province and broader public sector” according to the footnote. That is where things like provincially owned rapid transit lines balance the debt used to build them. If Toronto owns a new subway, there is no provincial asset, and the borrowing needed to pay the provincial share shows up in the Accumulated Deficit. Toronto expects to receive over $4 billion from phase 2 of the Public Transit Infrastructure Fund which itself is part of the much larger federal Investing In Canada Plan (ICIP). However, the projects to which Toronto planned to dedicate this money do not match the provincial list with only some version of a Relief Line and the Scarborough Subway in common. Ontario includes the Richmond Hill subway and the Eglinton West LRT in its priorities, while Toronto includes the Bloor-Yonge station expansion and SmartTrack stations projects. It is quite possible that Ontario priorities both in transit and in “green infrastructure” spending will soak up all of the federal money nominally available to Toronto. Provincial cost estimates are always stated without inflation to the point of construction. The cost will be higher if this is an estimate in current rather than future dollars, and yet the province makes comparison to city/TTC estimates that include inflation. This makes the provincial estimates appear lower, relatively speaking, than actual spending really will be. A thread running through recent City debates has been the inability to keep projects “on budget” and part of this arises from budgets that are set too early in the design process to be reliable. The debate over the Scarborough Subway Extension turns on the creep between an original claim that it would cost only a few hundred million more than the LRT plan to the now-known jump to over $5 billion for the three-stop version. It is simply not credible that the province could have design work for new lines advanced to the point of an estimate that has only a small margin of error. At a comparable point in the city’s process, that margin could be up to 100%. Finally, all estimates are subject to market pricing especially where public-private partnerships come into play, and they will carry the hidden future cost of financing. If Ontario’s cost estimates prove too optimistic, who will pick up the difference? Would municipalities be on the hook for a share of extra costs, or could they simply tell the province to pay for cost overruns on their own projects. By analogy, the overrun on the subway extension to Vaughan was covered by Toronto and York Region. For reasons passing understanding, the original announcement of Ontario’s transit plan was short on details, some of which were included in the budget. This contributed to needless confusion not to mention the sight of evasive answers to questions by Ministers and officials who could have better defended their plan, but were reduced to a handful of talking points. The map in the budget shows a bit more detail than the one included in the Premier’s announcement only a day earlier. Even this map is preliminary and subject to refinement. The province claims that it can deliver this project at lower cost through various changes including bridging over the Don River at East Harbour rather than tunneling below it. It is unclear how this would be achieved given physical constraints and planned development in the area. At least this settles the issue of “which Don River crossing”, but not the question of how it would be built. to “… deploy lighter, more cost‐effective and modern trains that have fewer signalling problems … than existing TTC subway trains”. It is a matter of record that plans for the Relief Line included modern signalling akin to what is now under installation on Line 1 Yonge-University and planned for Line 2 Bloor-Danforth. trains that would be “cheaper to operate”. This can refer both to the benefits of new technology but more importantly to automated, unattended operation such as found on lines like Vancouver’s SkyTrain, a system that has been operated for decades. the line “would not be dependent on the requirements of the technologically outdated Bloor‐Danforth Line”. This refers to the size of trains used on BD, but also to the current signalling and control technology. To call the BD “outdated” ignores the fact that rapid transit systems all over the world operate with the same technology. The anticipated cost is $10.7 billion, subject to the caveats above regarding currency and accuracy of the figure. This project is projected to cost $5.6 billion (subject to caveats), and it is quite clear that it would open as soon as possible after the Ontario Line to deliver on political promises to York Region. Whether this schedule will hold if the Ontario Line runs into construction problems remains to be seen. The need to make better use of Richmond Hill GO is a long-overdue commitment to exploit existing infrastructure where possible. This will not address all demand between Richmond Hill and Union Station, but it could take a slice off of the crunch facing the Yonge subway. The Bloor-Yonge expansion gets a mention, but there is no money allocated to it and, as noted above, PTIF money Toronto had earmarked for this could be scooped by Queen’s Park for its own projects. The funding scheme for the proposed three-stop extension to Sheppard is a mix of existing and hoped-for contributions. This means that Ontario expects Toronto to pick up inflationary costs above its current estimated contribution (which already includes inflation), and that the federal government will equally share the incremental cost of going north to Sheppard. This would more than double the federal contribution, and there is no indication that this money would actually be available. A related problem here is that the city and province do not yet agree on just how much Ontario’s “commitment” in Scarborough is really worth, allowing for inflation from when it was announced. In turn that would affect Ontario’s assumption of Toronto’s share of the project. This is a particularly good example of Ontario “enhancing” a project but expecting other governments to carry a large share of the extra cost. The completion date is 2029-30, three to four years later than the City’s plan to open in 2026. The total preliminary cost estimate of the extension to Renforth Drive is $4.7 billion, and the Province will look to the City and federal government for their contributions. [T]he Province would put a portion of the Eglinton Crosstown West Extension underground, primarily between Royal York Road and Martin Grove Road. The underground option is limited to the most congested part of Eglinton Avenue West and is not, as some claimed or hoped, for the entire extension. As previously reported, the province commits to an easterly extension from Don Mills Station to the planned McCowan/Sheppard terminal of the Scarborough subway. However, this is sufficiently far off that the main effect of the announcement is to squelch any hopes for the LRT option in this corridor. There is very little news about Metrolinx in the budget beyond the recitation of works already completed and known expansion projects. The GO Expansion program will continue although the technology is not yet settled. This is old news, and reflects the process set in motion by the previous government by which the technology choice and pricing will be part of proposals to build and operate the expanded network. The budget puts a bit more flesh on Premier Ford’s transit announcement, but leaves many questions especially regarding who will actually pay for all of his plan, and how much of it can progress beyond design stage during his current mandate. 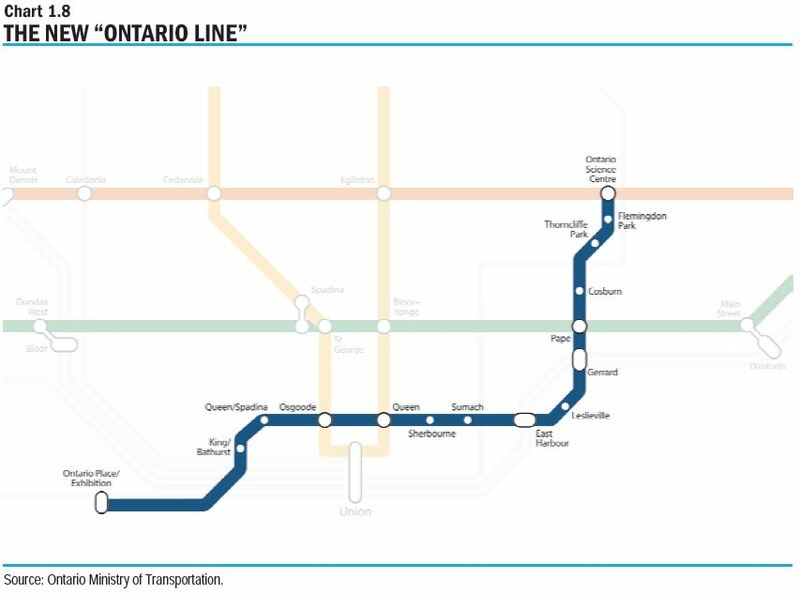 Some schedules are quite optimistic including the Ontario Line for which detailed design only exists for the original RL, and that based on a technology the province denigrates and rejects. How much Ford will have to show for his efforts by the next provincial election remains to be seen. He could discover the same problem as the McGuinty/Wynne government that getting from announcements to tangible progress is difficult, especially if changing financial circumstances make original promises impossible to deliver. For its part, Metrolinx takes on a huge program where making the government look good is top priority. This is far more than cooking the books to “justify” a new GO station in a Minister’s riding. It is a massive network expansion that, even assuming the funding problems are settled, will strain that agency to deliver. Telling Premier Ford that his signature projects might not be delivered “on time, on budget” would be suicidal. Delivering on this scale might not be as simple as the “experts” at Metrolinx and Infrastructure Ontario think, and the day may come when the province will no longer be able to gloat over alleged shortcomings in TTC’s project delivery. This entry was posted in A Grand Plan, Downtown Relief Line, Eglinton LRT, Finance, Scarborough RT/LRT/Subway, Sheppard Subway, Subways, Yonge Subway Extension. Bookmark the permalink. The Ford PC government is bankrolling the shiny photo-op-able projects but little for the day-to-day, state-of-good-repair, upgrades needed for public transit to operate each and every day. Is the portion of Eglinton between Martin Grove and Royal York truly “congested”? I drive that portion of Eglinton most days and my personal experience is that it’s a breeze between Kipling and Royal York. The only area I can see being characterized as congested would be between Kipling and Martin Grove (~1 km length). This may be irrelevant, considering that facts do not seem to matter in transit “planning”… another consideration that makes the proposal to tunnel preposterous is the ridiculously wide existing right-of-way… ~100 m wide (!) in the stretch between Islington and Royal York. It looks to me that even at the narrowest part, the ROW is at least 40 m wide. Steve: The right-of-way is very wide because originally this was going to be the Richview Expressway. Some of the land has been sold for development, but even then, the city retained enough room to widen the road for an LRT right-of-way. What we are dealing with is the streetcar-hating Ford brigade, compounded by some of the bone-headed designs included in the original Eglinton West LRT scheme by the City, notably “Michigan Left Turns”. Thanks. I attended Martin Grove Collegiate, 45 years ago, and appreciate confirmation it is still not really congested. Um, when Rob and Doug sat on city council they represented a ward in North Etobicoke. The three kilometres between Martin Grove and Royal York is the section closest to the original “Ford Nation”. Maybe you knew that? The good thing about the Ontario Line is that the trains will be lighter and smaller which will allow for environment friendly green hydrogen technology to be used. Steve: Actually that is a red herring. Hydrogen technology is intended for situations where a line with relatively little traffic is to be electrified. A rapid transit line is far better powered by electricity through a third rail or overhead wire. Also there are major safety issues with hydrogen propulsion in a tunnel. One hopes that, as they begin the long process of designing this Ontario Line, Metrolinx makes sure that a westward extension/spur on the north side of the rail corridor towards Dundas West Stn remains feasible. Steve: This will be tricky not least because that corridor is extremely crowded already. Any new line would have to go above or below it, and there are challenges to both variations. One might also want to ask about the sense of building a subway to Dundas West when there is a surface railway corridor with no less than 4 tracks going there already. We already have the right of way! Even the rails! We just have to run trains on them! Elsewhere in the world manages trains every 5 minutes or better. A not-particularly-good two-track corridor in London has Overground trains every 7.5 minutes in rush hour and they even manage to fit in short cargo trains in between every-15-minute off-peak service. A four-track corridor through Berlin has regional trains every 15 minutes per direction on one set of rails and city trains every 3 minutes on the other. Yes the rail corridor will need electrification and better signaling, but we’d have to electrify and signal a subway line anyway. Yes it will need subsidy to get it to TTC fare, but we’d need that anyway for the subway. The right of way is there already, let’s use it. How long might the middle of Queen Street be torn up for this work? Or can they get a tunnel boring machine into Queen Street Under to start from there? It will be interesting when they find that everything south of the railway tracks is landfill. So this is an exercise in reducing the Province’s deficit by recognizing the full amount of the subways as non-financial assets while the funding comes from the Fed, City and Province. The Province puts in $11B of funding and gets an asset of $28B, voila! the Province has saved the taxpayer $17B. Same money, same asset, different account rules. Expand that – take the whole subway and the air rights and now there are even more non-financial assets to put on the books. Steve: This is an interesting question. When the province “amortizes” an asset like a new subway line, do they treat the full amount, including that paid for up front by others, as an asset, or only the part they paid for. I will pursue this. Sigh. I am not saying try to build it right away. Let’s just make sure that the design on the OL doesn’t preclude us building the extension a few decades hence. I agree, more GO/Up service on the corridor, improving the connection between Dundas West Stn and the GO corridor, fare integration, and looking bettering the priority on our streetcar lines are better investments right now, and should be the priority in the immediate term. I’m just wouldn’t want to place a bet that those measures will prevent a Bloor/Yonge style problem from developing at St George. Why are some people so concerned about what level of government owns the subway system? As a customer, I am worried about the quality of the service and not who provides it. Those opposing the subway upload would not be opposing it if it was done by a Liberal or NDP government. Steve: Actually they would because the lack of understanding and competence regarding the scale and complexity of TTC operations has bedeviled the Ministry of Transportation and Metrolinx for years. Some ambitious people at the provincial level want to get their hands on the TTC’s big train set, and in Doug Ford they have found a sympathetic ear. McGuinty’s people looked at this and decided it was a cost and political complexity best left with the city. For the NDP, the doctrinaire imperative to privatize everything in sight is utterly foreign and this kills off a big reason for seizing control of the system. I was initially not happy that Ford became Premier but my views have since changed as Ford has done many good things as Premier. Ford reduced short distance GO fares. Ford extended GO train service to Niagara Falls. Ford has increased service on other GO lines as well. Ford is moving forward with his subway plan as promised in the campaign. All this and more in just a few months and more to come. Let us hope that the federal government and municipal governments will co-operate to deliver better transit service for us all. Steve: A change in the GO fare scheme was already in the cards under the Liberals. The Niagara Falls “service” is one train a day that leaves the Falls at an hour hardly any commuter would want to use, 5:19 am. Service improvements on other lines are part of a plan GO already had in place. Ford just had the luck to be Premier when work in progress reached the point of implementation. Steve said: The Niagara Falls “service” is one train a day that leaves the Falls at an hour hardly any commuter would want to use, 5:19 am. I came across that schedule recently. That timing is a real head-scratcher, as it arrives at Union at 7:50. A 2.5 hour train ride to commute is nuts, clearly the only users must be commuting to somewhere closer on the line – therefore the train should leave a lot later. Then again, I am aware that there are a few people who commute by train between TO and Kingston or TO and London. Steve: That train is entirely a piece of political theatre so that Ford and Metrolinx can say “we did it” without providing meaningful service to the Falls. Steve, why are Michigan left-turns boneheaded? Where they somehow going to make a LRT do one? (Am truly ignorant here, not trolling). Steve: The turns were for motorists to avoid left turns across the tracks. The geometry of these did not make sense in the proposed road designs considering that a lot of the affected traffic would be large trucks. Ross. The GO train commute time from Waterloo Region to Union Station is about 2.5 hours as well even though it is closer. Rail commute outside the GTA is generally a nightmare as far as I can see.